Here’s a quick pastry I made from leftover puff pastry, pastry cream, and choux paste. 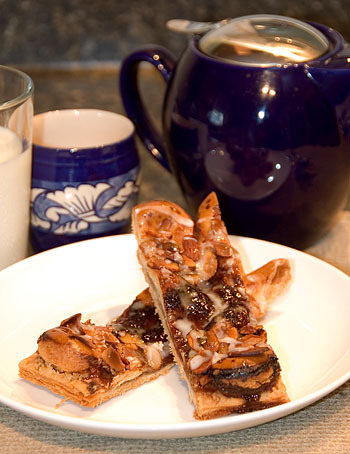 It makes for a great breakfast pastry and a good way to use up your leftovers. There isn’t much recipe here but I’ll give you some pictures to show you how it is done. 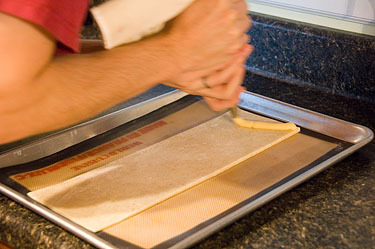 Roll out some puff pastry about four inches wide and about the length of a half sheet pan. Prick the dough all over so it doesn’t rise all that much. The goal is for a flaky texture not a tall puff. Spread the pastry cream over the entire pastry in a nice thin layer. 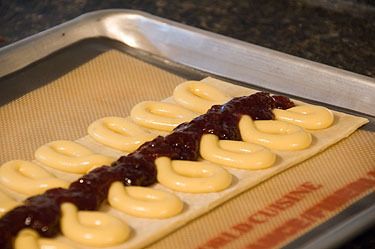 Place the choux paste in a pastry bag and pipe out figure eights down the length of the pasty. Try to keep the eights close to each other but don’t have them touching. 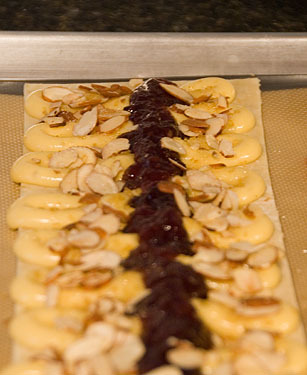 Pipe a nice think line of jam down the center of the pastry where the eights overlap. Combine sliced almonds and some large-crystal sugar together and spread over the entire pasty. I left the center jam portion uncover just for presentation purposes. Bake at 375F for about 20 minutes or until the choux paste is a nice dark mahogany and the puff pastry is cooked all the way through. If you don’t cook the choux enough, it will deflate as it cools and it will have an unpleasant undercooked center. After the pastry cools garnish it with some simple icing (powdered sugar and milk) lightly. Slice and serve! That’s about all there is to it! Slice up the pastries and enjoy. Nicisme: You should definitely try it out, it’s rather easy to make if you have all the ingredients on hand and good practice to keep your skills up. I’ve never seen this before! It looks really good, I might have to give it a go! Thanks for posting.